I’ve been wanting to write a series of posts about my favorite kitchen items for some time now but never got around to it. Then the other day I was approached by the nice people at Challenge Butter (the butter with the elk on the box) asking if I’d like a package of their products. Considering their butter is a product I already use, I figured why not. Well, I received the package and not only did they give me coupons for free butter (some for me and some for you! ), they also sent me OXO and Spice Islands products. Since most of you have never been to my apartment, you don’t know how much I love OXO, especially their cookie scoops, whisks, and storage containers. They’re clear, so you can easily see what is in each container. They’re airtight and the lid comes off with a push of a button (literally). I used to have containers that would cause my kitchen to be covered in flour every time I opened the container; these don’t do that. 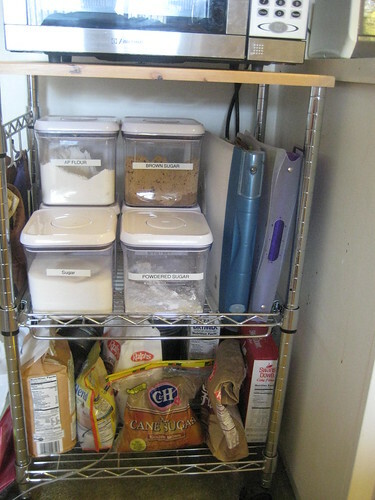 They’re stackable which is great for people like me with limited kitchen space. They’re more than wide enough to put a large scoop in, so you don’t have to spoon flour into the measuring cup. What are some of your favorite kitchen tools? What can you not live without? And finally, want a free box of butter? Leave a comment below by midnight EST on Sunday, November 22, 2009 and you will be entered for a chance to win one of three coupons good for a free box of Challenge Butter. U.S. residents only please. Next in the series: My favorite mixing bowls. And in super exciting news, Rachel of Coconut & Lime wrote a cookbook called The Everything Healthy Slow Cooker Cookbook and it’s available for pre-order on Amazon now! who doesn’t like free butter? i have absolutely no knife skills, so the chopper thingamabob i have is really a life saver. i guess it’s called a slap chop? I see you dont do your brown sugar in one though. I LOVE being able to have a contianer for brown sugar and I get one of those terra cotta bears or a chunk of terra cotta, soak it and it keeps it fresh and soft forever in one of those containers. I just got married so I have a ton of new kitchen toys all vying for my affections right now so its hard to pick a favorite! Ha. I’m dumb and apparently wasn’t actually looking at the containers- you do store your brown sugar that way! So glad to hear of your love for our products! I’m work in OXO’s marketing department and it warms my heart to hear your kind words!! We actually just launched a video contest – “The Search for the World’s Biggest OXOniac.” Winners receive a trip to NY, $1000 worth of OXO products, and a starring role in our “How-To” videos. Since you’ve done such a great job describing our POP Containers, how about trying your hand at a video submission? Check it out at http://www.oxocontest.com. I love my cookie scoops, too, and my silicon wisk and spatula. Silicon is a godsend. So easy to clean and it doesn’t melt like regular plastic. I’ll have to add the containers to my list. I made a batch of muffins this weekend and was super irritated that I got flour all over my counter with both the whole wheat and all purpose flour. I would like a free box of butter. Therefore I will say butter is my favorite kitchen tool. My favorite utensils are my 30 year old Graham Kerr Spurtles. The best way to describe a spurtle is a wooden spatula/paddle, originally invented to stir porridge as it cooks. Of the set of six, I only have 2 left. They are still great to stir anything thick! I have greatly enjoyed your blog and have to admit to making the Strawberry Buttermilk Cake recipe numerous times as well as (oh! Heaven!!!) the Snickerdoodle Muffins which are asked for at every family and friends gathering at my house. I have a question for you as clearly you are a fan of excellent kitchen tools. I’ve had a very difficult time finding a long, narrow rubber (or reasonable facsimile to rubber) scraper or spatula. Rubbermaid used to sell groups of 2 or 3 in a variety of widths. I just don’t see these anymore and my treasured older one (well, really only about 2 years old but has seen a lot of bowl miles) is alas begging for retirement. So the question I have for you is – any idea where I could acquire some narrow flexible spatulas or scrapers? Thanks! I’ve shared your blog with several friends, it really is a most enjoyable read and more often than not we all try your recipes with success — and acclaim! It totally makes me happy that I’m not the only person that uses their label maker for things like that. 🙂 Love those containers, I think I might have to get me some of those! My favorite kitchen tool is my mixer. My favorite kitchen tools are my silicon whisk and, if appliances count, my brand new hand-held immersion blender. I’m in a soup-making frenzy, even though it’s still 80 degrees here in Florida!